The Nigeria population is one of the fastest growing in the world, precisely the 24th fastest. According to the United Nations and the Nigerian population commission's projections, Nigeria has a population of approximately 196 million people. This is the entity with the largest population in Africa and seventh largest in the world. The projections still go positive though as the country is projected to be the 3rd largest country by population in 2050! Nigeria has over 250 ethnic groups and over 500 languages with majority citing Islam as their religion(50%). 40% of the population proposes the christian religion while the remaining 10% goes to minor religions in the secular state. The country has an average value of 20.3 years of age as the age women starts having their first child. 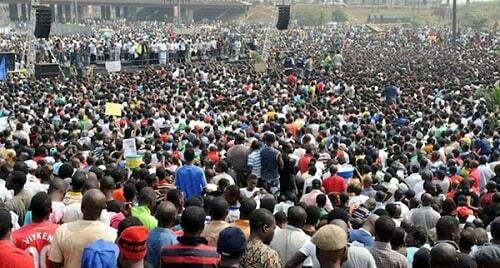 Nigeria's government has regularly aired out that it wanted to halt the rapid growth in population. Birth contraception have been distributed to certain government owned clinics coupled with steps to discourage people who are looking towards having large families. The country whose menace has been overpopulation and widespread corruption depends on curbing the high increase in population as a way making a good economic future.